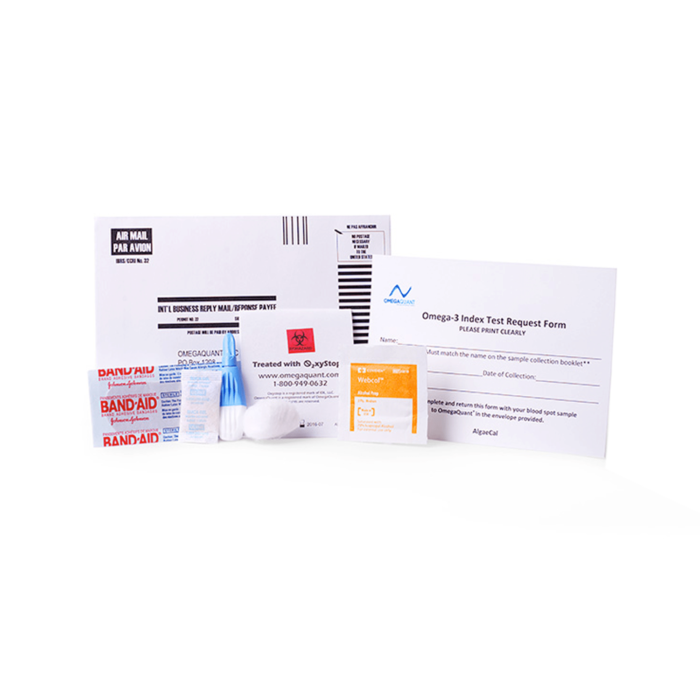 At-home test kit allows you to test the omega 3 levels of your blood in seconds! 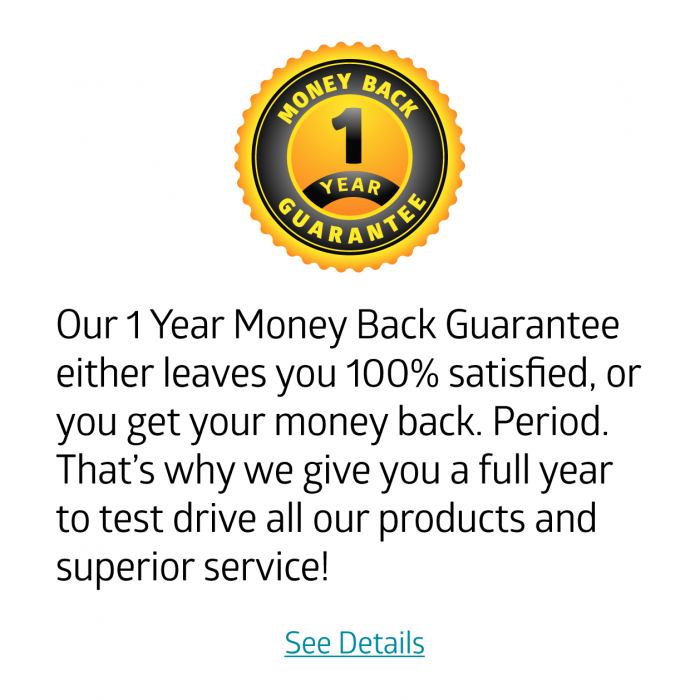 Get your test results within 5 business days of the lab receiving the sample! 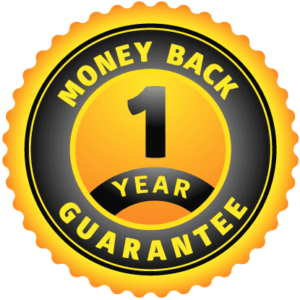 Omegaquant Analytics is the leader in omega 3 testing! 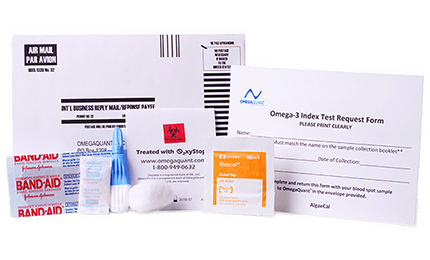 The leader in omega 3 testing, OmegaQuant Analytics, provides a kit requiring only one drop of blood. 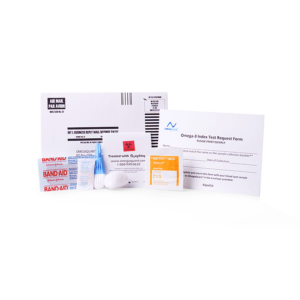 Mail the kit off and get your results within 5 days of receiving the sample. Why test your red blood cells? Red blood cell levels of omega 3’s are representative of levels found in organs such as the heart and brain. 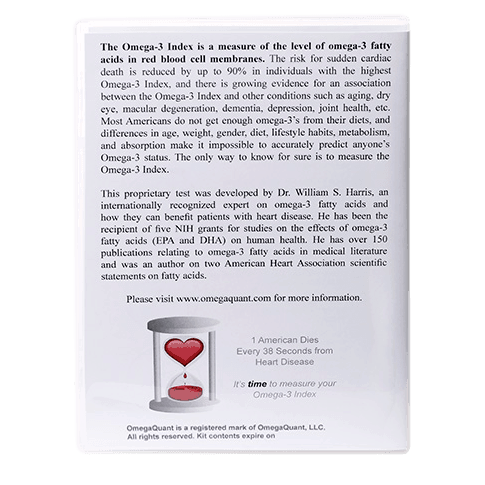 Research shows that low blood levels of omega 3’s are related to disease and early death. For example, increased risk of fatal heart attack, depression, arthritis, and possibly dementia. And it is clear that most Americans have low Omega 3 levels! It is also known that consuming more omega 3’s (EPA and DHA), will improve the cellular concentration. So test your level now, and then measure your improvement after taking Triple Power Fish Oil. Note: OmegaQuant cannot analyze samples from the state of New York due to New York state regulations. Why Measure Your Omega 3 Index? Because the only way to know if you have healthy levels of these critical fats is to directly measure them. Most people have levels that are associated with increased disease risk, so it is best to find out now and top up on omega 3’s if necessary. Eating fish and supplementing with regular strength fish oil does not mean your omega 3 levels will be optimal. Differences in metabolism, absorption and genetics mean individual scores vary even with the same EPA/DHA intake. Best to test and find out. 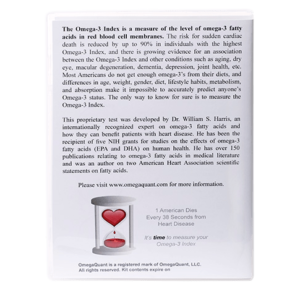 Here is a sample of the report you will receive from your OmegaQuant test. You will learn your omega 3 Index. That means the percentage of EPA and DHA Omega 3’s in your red blood cells. The target Omega-3 Index is 8% and above. This is a level that current research indicates is associated with the lowest risk for death from heart disease. It is also a typical level in Japan, a country with one of the lowest rates of sudden cardiac death in the world. An index of 4% or less (which is common in the US) indicates the highest risk for cardiovascular disease, dementia, and increased aging. 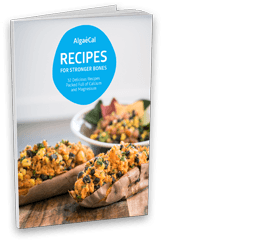 How Fast Can My Low Omega 3 Be Corrected? Raising your Omega-3 index is determined by the amount of EPA/DHA consumed over time. Also, the absorption ability of the Omega 3’s plays an important role. For example, Omega 3’s from plant sources such as flax or chia seeds are very poorly absorbed. Fish oil is exponentially more effective at reaching your cells. But there are differences in absorption capabilities among fish oils too. Fish oil in capsules is the least absorbable and fish oil emulsions are the most absorbable. 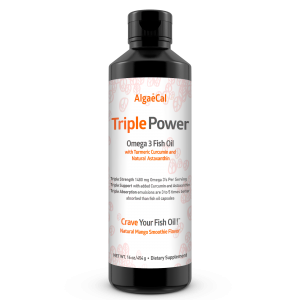 The easiest way to increase your Omega 3 Index is by taking a double dose of Triple Power fish oil. Triple Power is a highly absorbable emulsion with high EPA/DHA. So two tablespoons daily will normally move a 4% Omega Index to 8% within 3 months! Taking a single tablespoon will yield the same result but takes about twice as long. Moving your index from 4% to 8% is unlikely to occur from eating oily fish alone. Supplementation from high EPA/DHA fish oil is necessary. 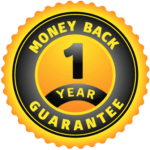 AlgaeCal Inc. researched all of the available Omega-3 tests. 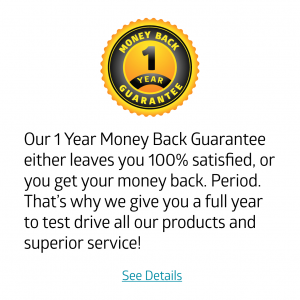 We selected OmegaQuant because it is the most credible and accurate test on the market. National Institutes of Health clinical studies used it. It is also the only test that is a simple finger poke. The others require getting a blood draw from a lab. Low cellular concentrations of omega 3 have been linked with cellular aging. Higher cellular concentrations are associated with greater health and longevity. Also improved brain and cardiovascular health. 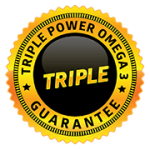 Triple Power Omega 3 Fish Oil’s unique profile will significantly increase your omega 3 blood levels in just 90 days if you take it as directed. Some organs especially need larger concentrations of omega 3 such as your brain, heart, eyes, skin, joints and more. For best health, blood levels of 8% or more is the goal. 4-8% is intermediate, and lower than 4% is undesirable.